The second biggest win in their history (115 points) for Port Adelaide sees them overtake Sydney and gives them a provisional top four spot before Richmond play tomorrow against St Kilda. This will be the lowest score ever conceded by Port Adelaide, bettering their previous lowest of 3.9 (27) that they restricted Melbourne to in round 9, 1997. Port Adelaide has now pushed the margin out to 103 points. The last time that the Power won a match by 100 points was in round 22, 2014 when they defeated Carlton by 103 points. Ollie Wines is now up to 30 disposals for the seventh time this year, the most times he has achieved this feat in a season. He also has matchhighs in contested possessions (15), metres gained (510) and score involvements (11). The poor ball transition from defensive 50 to forward 50 for the Suns continue. They were the worst performed side in the past month heading into round 23 converting at an average of 14 per cent and are tonight at just 11 per cent conversion. This is the ninth time this season that Port Adelaide has kicked over 100 points in a match. This beats their efforts of last season by two. The Power are ranked last in clearance differentials in the last month, losing the count by an average of more than eight. They have managed to even the clearances tonight (27 apiece) and lead the centre clearances by four. The greatest winning margin for the Power against the Suns is 72 points, occurring earlier this season in their Shanghai match. Their greatest winning margin this season is 90 points (round 5 v Carlton). Hamish Hartlett had an impressive third term collecting eight disposals (four of these contested) at 100 per cent efficiency. 2017 has been his best year for disposal efficiency (going at 78 per cent) beating his 2009 season where he went at 76 per cent. All four of the goals kicked by Port Adelaide this quarter has been sourced from turnovers. Gold Coast have committed 18 turnovers this quarter with seven of these resulting in a score for the opposition. Jarryd Lyons leads the match in groundball gets with 10 and also leads his side in clearances (four) and contested possessions (10). Lyons is averaging careerhigh numbers in clearances, tackles, disposals and contested possessions this season. Port Adelaide has had 17 possession chains originating in their defensive 50 zone resulting in seven inside 50s. Gold Coast has had 46 possession chains originating in their defensive 50 zone resulting in just three inside 50s. Port Adelaide lead the tackle count by three despite also collecting 16 more disposals. Brett Ebert has laid seven tackles, continuing his careerbest season for tackles where he is averaging just under eight per match. Sam Gray has grabbed a matchhigh four marks inside 50 and booted through four goals. This is an equal career-high goal haul for Gray matching the four goals he kicked earlier in the season against North Melbourne. The Suns get the first inside 50 of the quarter, their first entry since the 15th minute mark of the second quarter. In this time, the Power managed to go inside 50 14 times and scored 2.4 (16) from these entries. Port Adelaide has 41 inside 50s to halftime, their best result of the season. In contrast, the Suns 14 first-half inside 50s is their second lowest total for the year narrowly beating their 13 first-half inside 50s against Collingwood in round 13. The 47 point margin is the largest ever halftime margin between these two sides. 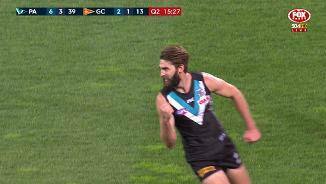 This eclipses the 43 point margin Port Adelaide against the Suns in their round four clash in 2013. 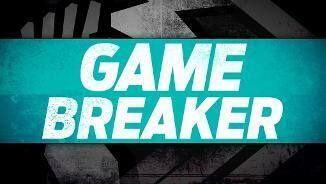 Port Adelaide now lead 8.3 (51) to 1.0 (6) in scores sourced from turnovers. Six of these goals have been from forward half intercepts as the Power lock the ball inside their attacking half (73 per cent time in forward half this match). Charlie Dixon has taken as many contested marks (3) as the entire Gold Coast team has collectively tonight. The Power now lead the inside 50s by 18, just three off their largest differential to half time this season. This is also on track for the Suns to record their worst inside 50 differential to half time this year (minus 19). The Power are pulling away with the match, kicking 5.0 (30) from eight inside 50s this quarter to no scores by the Suns from their two inside 50s. The Power have scored on 46 per cent of their forward 50 entries this season (ranked 10th). The Suns contested game has dropped away this quarter, losing the contested possessions by 11. Ollie Wines and Travis Boak both have won six contested possessions each, whilst the most for the Suns is Mitch Hallahan with five. The Power have greatly improved their scoring efficiency this quarter, with their first three goals of the term coming from their first three forward 50 entries. 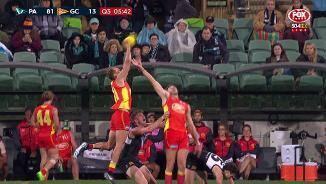 Port Adelaide has taken eight intercept marks compared to the three for the Suns. These intercepts are the main source of goals for the Power, who have kicked 3.1 (19) from turnovers. Port Adelaide led the inside 50s (1911) and time in forward half (73 per cent) comfortably but were unable to convert this dominance to the scoreboard leading by just two points. Port Adelaide are going at a wasteful 48 per cent kicking efficiency in their forward half, whereas the Suns are kicking at 71 per cent efficiency in their attacking half of the ground. Power captain Travis Boak has the ball on a string winning nine first quarter disposals, four of these being contested. Boak is spending more time forward this season, with over 19 per cent of his disposals being won in the forward 50 this year. Paddy Ryder is dominating the stoppages, with three of his seven hitouts being to the advantage of a teammate. Despite his dominance, the Power trail the clearances by one. The first goal of the match for Robbie Gray is his 47th goal of the season. This is a careerhigh for Gray, whose previous best season haul was 42 goals in 2014. After conceding five of the first six inside 50s, the Suns have managed to sway the momentum by recording the last five entries into their attacking forward 50 zone. This is the first ever time that Port Adelaide is playing the Suns at the Adelaide Oval. Gold Coast has only ever played two matches at the venue, both against the Crows. 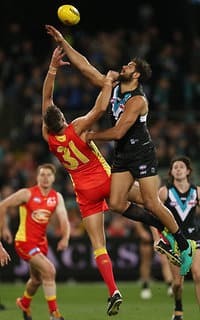 The Suns have only defeated Port Adelaide once in their eight encounters which was also their first ever win in the AFL. This maiden victory for the Suns in 2011 is the only time that they have kicked over 100 points against the Power. Port Adelaide has struggled to win the territory battle in the past month of football, losing the time in forward half by an average of just under eight minutes per match. This is the third worst result of all sides in this time frame. Welcome to Adelaide Oval for the Port Adelaide v Gold Coast Suns Round 23 clash. 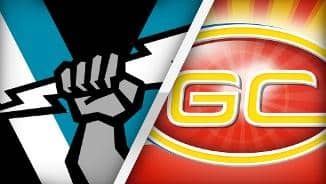 PREMIERSHIP contender Port Adelaide has warmed up for the finals with a 115-point thumping of an inept Gold Coast at Adelaide Oval on Saturday night. The 20.15 (135) to 3.2 (20) victory moves the Power up to fourth on the ladder and sets up the possibility of an all-South Australian qualifying final with minor premiers Adelaide. The Power needs Richmond to lose to St Kilda on Sunday to remain in the top four, otherwise they will slip to fifth and host an elimination final. Final twist: What winning margin gets Eagles in? After a competitive first quarter where the Power led by just two points, they booted 12 consecutive goals while keeping the Suns scoreless for the second and third quarters. 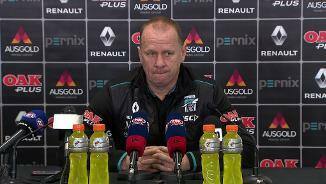 "We're in pretty good shape, we've played some good, strong footy in the last three weeks," Power coach Ken Hinkley said. "You can't do much more than what we did tonight, which gives us an opportunity that we set out at the start of the year to be a part of the finals. "We had control of the game in the first quarter, we just weren't able to hit the scoreboard, but eventually you're going to break through when you have that much opportunity." 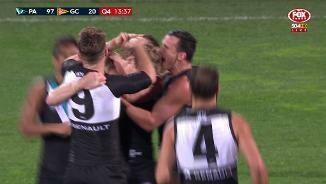 It was the Power's second-biggest win since they entered the AFL in 1997, falling just short of a 117-point victory over Hawthorn in round 13, 2005. The Suns' eighth straight loss drops them to 17th on the ladder with a 6-16 record and guaranteed the two Queensland sides have the first two picks in the 2017 NAB AFL Draft. It was the also the Suns' lowest score in their seven-year history, surpassing their return of 4.10 (34) in a 38-point loss to the Western Bulldogs in Darwin in round eight, 2012. 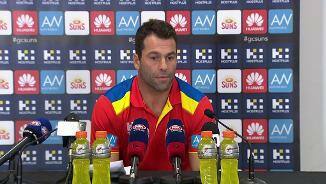 "We expect a lot more than that," interim Suns coach Dean Solomon said. "We respect Port Adelaide and what they're doing, that's what a top-four side looks like. 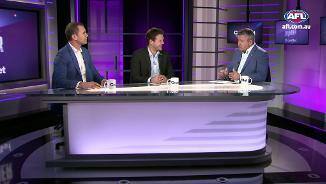 "They play a brand of footy that we're trying to implement." Power small forward Sam Gray had a night out, kicking a career-high six goals, while key target Charlie Dixon took his former side to school with four majors. Power prime mover Ollie Wines (32 disposals), skipper Travis Boak and Brad Ebert controlled the midfield and ruck Paddy Ryder made the most of the Suns being without first-choice rucks Jarrod Witts and Tom Nicholls. The Suns put up a decent fight in the first quarter before the Power turned the screws. It was all one-way traffic in the second and third quarters with the Power dominating the inside 50s 41-9, winning contested possessions by 28 and scoring shots 21 to nil. The only concern for the Power was when star midfielder Chad Wingard left the ground in the third quarter with an ankle injury. 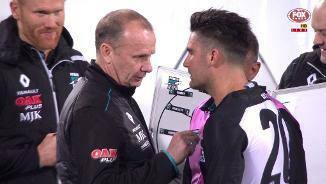 However, Wingard returned to the game to the relief of the 34,288-strong crowd. The Suns lost midfielder Jesse Joyce before the game with a back injury, joining wantaway star Gary Ablett and first-year player Jack Bowes on the sidelines. They also lost Callum Ah Chee in the third quarter with a thigh injury. 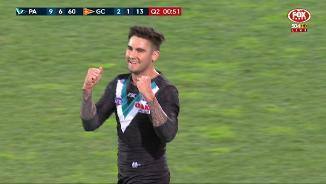 Port Adelaide: The Power have cleared star midfielder Chad Wingard of any serious injury after he came from the ground in the third quarter after having his foot stood on in a tackle. Wingard returned to finish out the game, allaying fears he may have re-injured his ankle. 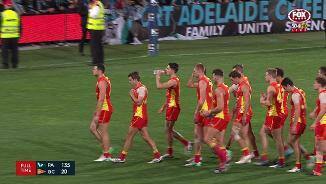 Gold Coast: The Suns lost Callum Ah Chee in the third quarter with a thigh injury. Defender Trent McKenzie rolled his ankle in the second quarter, but had it strapped up and returned to the game.